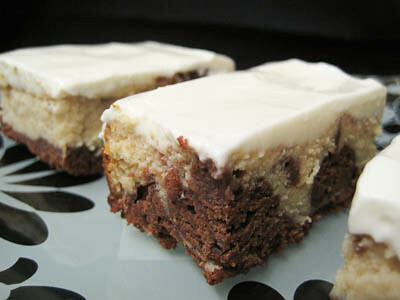 This week's Tuesdays with Dorie (TWD) recipe was chosen by Melissa of Life in a Peanut Shell: Espresso Cheesecake Brownies. 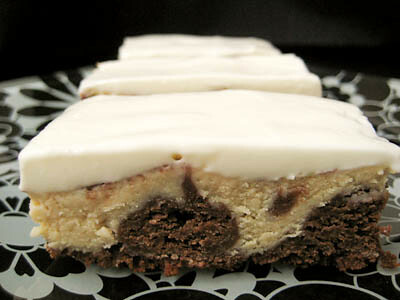 There's a bottom brownie layer, topped with a cheesecake layer with swirled in brownie batter, topped with a sweetened sour cream glaze. These were pretty simple to make, but do require several long periods of refrigeration - I wanted to eat these straight from the oven! I'll admit I was a bit unsure about this recipe, but it really surprised me. They're definitely not as chocolately as I thought they would be, but this is a great way to satiate a cheesecake craving without having to go through all the trouble of making a cheesecake. I'd probably describe these more as cheesecake bites than I would brownies, probably because the chocolate flavor is pretty subtle. Thanks Melissa, for picking this recipe. I enjoyed trying something new. If you would like the recipe, you can find it here. Make sure you check out the TWD Blogroll, to see how everyone else enjoyed this creamy, chocolatey treat. - I used 1 tsp of espresso powder instead of 1.5 tsp and felt this had plenty of coffee flavor! - I baked my brownies in a dark pan and they were done right at 35 minutes. - Wrapped well, these will keep in the freezer for 2 months (without the glaze). Love your pictures! Great plate! Oh yum, this is making me think all evil thoughts on what to have for breakfast! i really think yours is the first version i've seen to use the sour cream topping. it's something i definitely wouldn't skip! Yours are the first I've seen with the frosting. I thought I wanted mine with frosting. Now I know I do! They look good and I love sour cream! Your idea about making them into bites dipped in chocolate sounds wonderful. Your brownies look great! Your brownies are picture perfect! Great job! yeah, these were more cheesecake than brownie. i am all over the choco-dipped frozen idea--yum! These are some great looking brownies!!! I love your choco-dipped idea!! Hope to see them soon! That would just make this perfect!!!! I was surprised at how much more cheesecake-like they were. I bet they would be delicious dipped in chocolate! 3 layers of yum. Looks like your topping set very well. Ooh! Yours look perfect enough to be the missing photo in Dorie's book! LOVE your idea douse them in chocolate and make cheesecake bites! 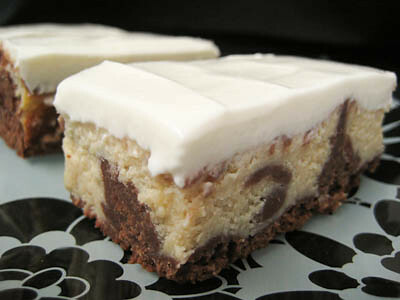 Your brownies look amazing - you've got the most perfect swirls! I agree completely with your review. These are definitely more cheesecake than brownie. I thought the trio of flavors all together was pretty tasty too! Your brownies really are so pretty.